A trailer wrap can add an extra dimension to your mobile advertising campaign! 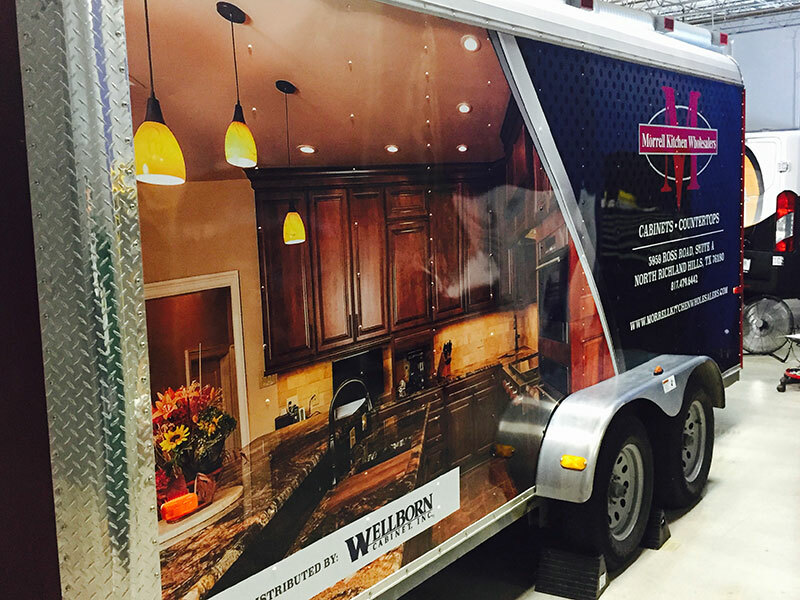 You can greatly increase company revenue, raise company awareness, and expand your marketing reach while distinguishing yourself from the competition with our fully customized, high-quality trailer wraps. Trailer wraps provide a larger “footprint” and can be easily seen in a crowd and from distance. If you’re considering trailer wraps in Fort Worth, TX or any location in the DFW Metroplex & surrounding areas for your company or personal trailer, give Metroplex Wraps a call and put us to work for you! 817-997-4431. A trailer is an ideal candidate due to its surface size. A trailer offers large, flat surfaces that can truly be turned into a mobile billboard, and their added height demands attention in traffic! A trailer wrap can easily be seen from a greater distance, and they can be made to match your vehicle graphics or to serve as an extension of the graphics seen on your truck or van. Our expert design team can create custom, effective, eye-catching designs for your trailer, whether you want a full wrap or a partial wrap to complement and blend seamlessly with your trailer’s existing paint. Whether you want a bold, graphic appearance, or something more subtle and professional, we will work closely with you to bring your vision to life. We will be happy to design a custom graphic that matches your needs perfectly. If you’re interested in trailer wraps in the DFW Metroplex or the surrounding areas of TX, don’t hesitate to call Metroplex Wraps today! Updated on September 19, 2018 at 9:10 pm by Metroplex Wraps.